This amazing image from the robotic Spitzer Space Telescope shows infrared light from the well-studied Helix Nebula (NGC 7293) a mere 700 light-years away in the constellation of the Water Carrier Aquarius. The two light-year diameter shroud of dust and gas around a central white dwarf has long been considered an excellent example of a planetary nebula, representing the final stages in the evolution of a Sun-like star. But the Spitzer data show the nebula’s central star itself is immersed in a surprisingly bright infrared glow. Models suggest the glow is produced by a dust debris disk. Even though the nebular material was ejected from the star many thousands of years ago, the close-in dust could have been generated by collisions in a reservoir of objects analogous to our own solar system’s Kuiper Belt or cometary Oort cloud. Had the comet-like bodies formed in the distant planetary system, they would have survived even the dramatic late stages of the star’s evolution. This strange object formed when a star like the Sun was in the final stages of its life is evolving to become a white dwarf star and appears as the tiny blue dot seen at the center of the image at bottom of the page. ESO’s VISTA telescope, at the Paranal Observatory in Chile, has captured a striking new image of the Helix Nebula. This picture, taken in infrared light, reveals strands of cold nebular gas that are invisible in images taken in visible light, as well as bringing to light a rich background of stars and galaxies. While hard to see visually, the glow from the thinly spread gas is easily captured by VISTA’s special detectors, which are very sensitive to infrared light. The 4.1-metre telescope is also able to detect an impressive array of background stars and galaxies. The powerful vision of ESO’s VISTA telescope also reveals fine structure in the nebula’s rings. The infrared light picks out how the cooler, molecular gas is organised. The material clumps into filaments that radiate out from the center and the whole view resembles a celestial firework display. Even though they look tiny, these strands of molecular hydrogen, known as cometary knots, are about the size of our Solar System. The molecules in them are able to survive the high-energy radiation that emanates from the dying star precisely because they clump into these knots, which in turn are shielded by dust and molecular gas. 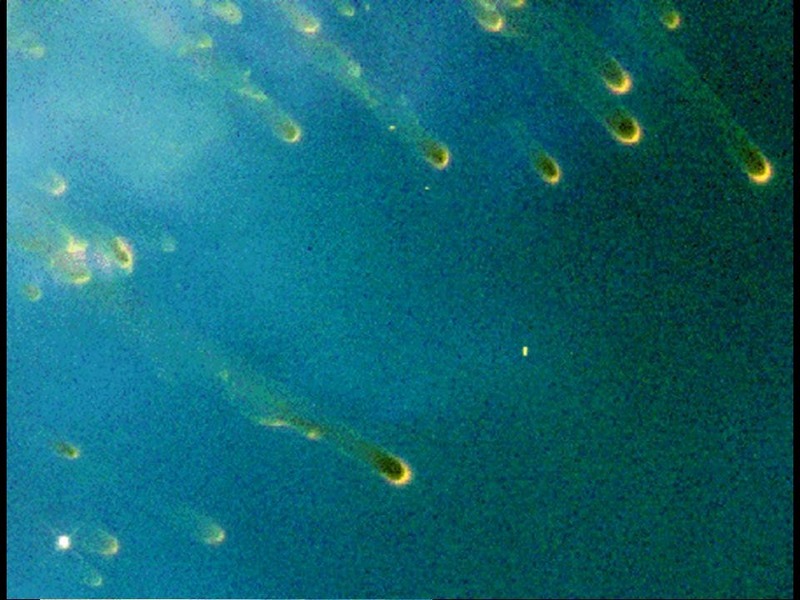 It is unclear how the cometary knots may have originated. 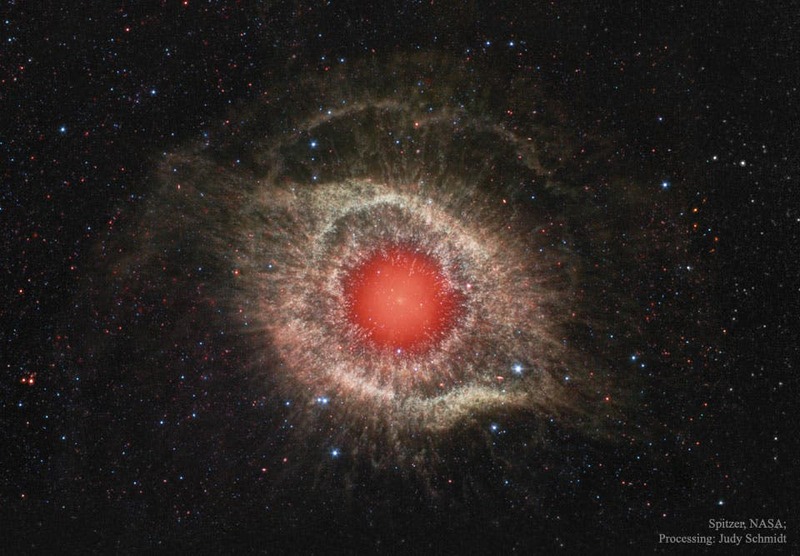 The Image below was made using the ESO’s Visible and Infrared Survey Telescope for Astronomy (VISTA) that captured this unusual view of the Helix Nebula. The colored picture was created from images taken through Y, J and K infrared filters. While bringing to light a rich background of stars and galaxies, the telescope’s infrared vision also reveals strands of cold nebular gas that are mostly obscured in visible images of the Helix.